As you can see, this is one powerful gaming laptop! The first thing I noticed about this machine is how clear and crisp the display is. In a word, it’s superb! At this price point, I suspected that Dell must have cut a corner or two in its design. Well, they did (more on that later) but not in a way that’s going to be a real issue. I also noticed the sleek design of the case. By no means is this anything like an ultrabook (and a gaming laptop isn’t supposed to be), but it’s a very attractive design nonetheless. While the 8th Generation Intel Core i7-8750H Processor makes this laptop great for gaming, it also makes it an outstanding general purpose or business laptop. This is one fast machine! The 16GB of DDR4 RAM is plenty for most games, but if you have a need for more you can double the installed RAM to 32GB. While the 128GB SSD allows for super-fast boot times and speedy performance, it’s quite small by today’s standards. Install just a couple of large games and a few other programs and your SSD will be maxed out. That being said, the internal 1TB hard drive has plenty of storage space to take up the slack. But it would have been nice if the SSD was large enough to hold at least a few of your favorite games. 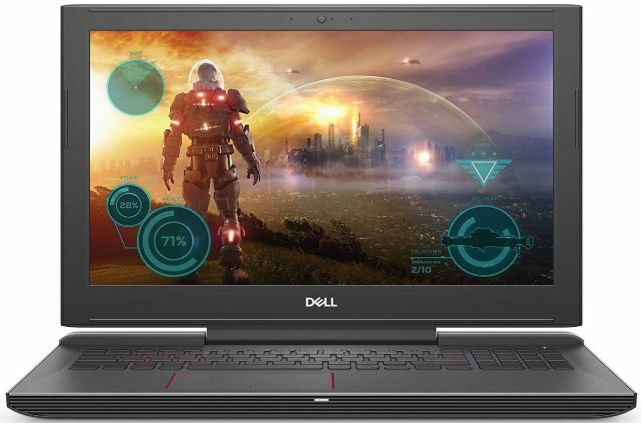 Bottom line: If you’re looking for an affordable, yet extremely capable gaming laptop, this one from Dell is a great option in my opinion. Click here to read more about the Dell G5587-7866BLK-PUS G5 15 5587 Gaming Laptop at Amazon.